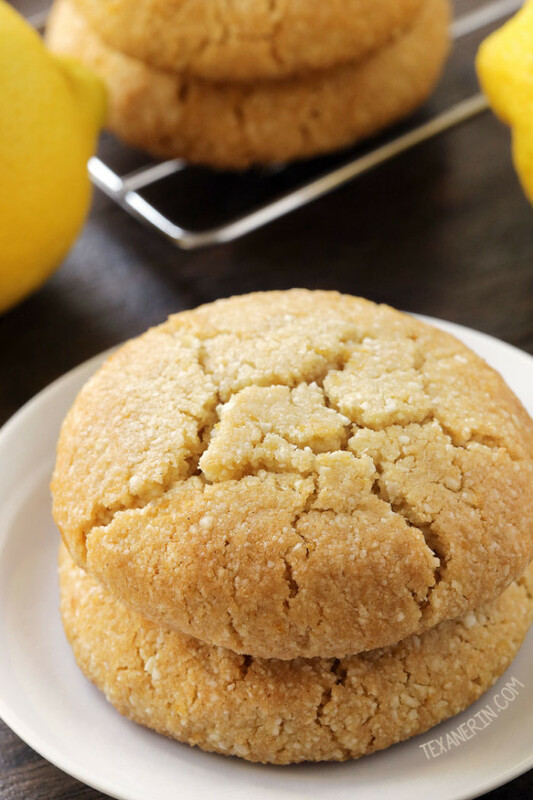 These soft and chewy paleo lemon cookies are vegan, grain-free, gluten-free, and dairy-free. Scroll down for a how-to recipe video! Unlike my last paleo cookie recipe, these paleo double chocolate cookies, you can tell these lemon cookies are grain-free. Those other cookies (and these chocolate chip paleo cookies) have almond butter in them doing all kinds of magical things to the texture but I didn’t want to add anything to detract from the lemon flavor in these cookies. But that doesn’t mean that these gluten-free lemon cookies aren’t delicious! They’re totally maple sweetened and surprisingly (and thankfully!) don’t taste a thing like maple syrup. I absolutely love the taste of maple – but not in my lemon goodies. I often use honey, like in my paleo mini lemon tarts and paleo lemon curd. I want that lemon taste to shine through everything else. :) I used the lightest Grade A maple syrup and recommend you do the same if you don’t want any maple flavor. Maple also worked great in this paleo lemon fudge! And hey, I’m finally posting a vegan recipe! Sorry, vegan readers, for my lack of vegan recipes as of late. And this is random but has anyone tried aquafaba? It’s the liquid from canned chickpeas and is used as an egg substitute. I have to admit that the thought of using chickpea brine turns me off. Whenever I make these chickpea cookies, I have to hold my breath when opening the can and rinsing off the chickpeas. To the people who have tried it – do your baked goods have the slightest hint of chickpeas?! I’m curious. But back to these vegan lemon cookies – with no eggs or gluten, I have no idea how they hold together so well but I’m not complaining! The cookies pictured would be considered regular-sized for gluten-containing cookies at about 2 1/2″ but when rolling them out, I didn’t take into consideration how filling almond flour-based cookies can be. So then I made them a little smaller and thought that was more suitable. And they’d travel better that way! While the larger cookies hold together well, I can see bad things happening if you just tossed them in a Ziploc and threw them in your backpack. For more paleo cookie recipes, check out my roundup of 75 Paleo Cookie Recipes You Can’t Resist! In a large mixing bowl, mix together the coconut oil, maple syrup, lemon zest and lemon extract. Add the almond flour, coconut flour, baking soda and salt. The mixture might be thin and wet and much more like batter than dough. It might not be. Do not add any additional flour! Chilling will firm it up. Let the dough sit for 5 minutes and then place the bowl in the refrigerator for 30 minutes or until the dough is firm. Preheat the oven to 350°F (176°C) and line a baking sheet with a piece of parchment paper. For the large cookies pictured, roll into six 50-gram balls. For smaller, more reasonably-sized cookies, roll into nine 35-gram balls. Place 3" apart on the prepared baking sheet and press the balls down slightly with your palm. Bake the smaller cookies for 10-12 minutes and the larger cookies for 12-15 minutes or until the cookies have lightly browned (not just the edges but also the middle of the cookies). The cookies may crackle a little. 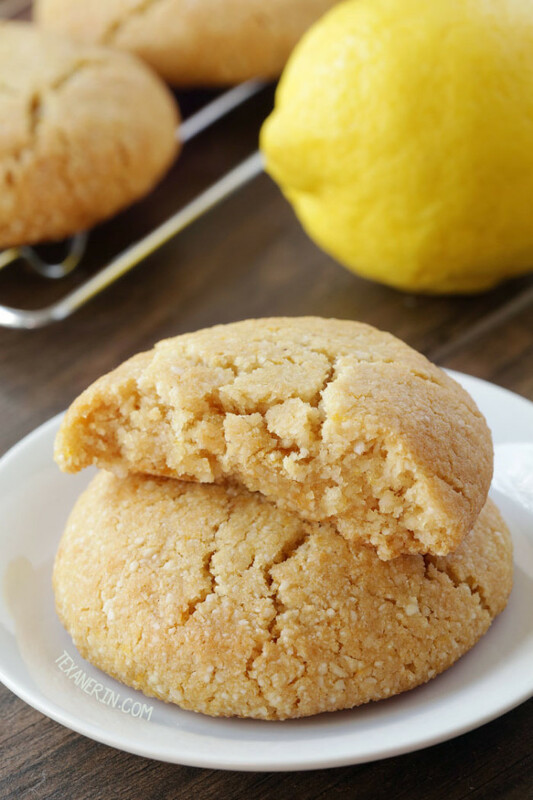 290 comments on “Paleo Lemon Cookies (vegan, grain-free, gluten-free, dairy-free)” — Add one! I love my cookies, I’m just starting out on my paleo lifestyle. Can honey be sub for maple syrup? I have a blended “paleo” flour ill be using. Also is grams measurement used in all the recipes? Thank you. You can use honey but you might need to bake these a little lower and for a few fewer minutes so that they don’t brown too quickly. I’m not sure if a paleo flour blend will work in this recipe, though. I’d recommend trying it as written first and then experimenting with your blend. :) I’m not sure what you mean by gram measurements used in all recipes. Do you mean do I use them in all my recipes? If so, yes I do. :) Hope you’ll enjoy the cookies! I just made them over the weekend. My picky husband loves them and asks for more!!! My dough came out dry at first, so I added 2 eggs last minute. Came out absolutely wonderful! Soft and moist cookies. Thank you so much! I’m so happy that you and your picky husband enjoyed them! I’m puzzled as to how you could add two eggs and have them come out well. But it’s great that it worked. :) Did you make any subs or changes at all to the recipe (other than the eggs?) Thanks for your comment! Oooh! Mint is an interesting idea. :) Sounds good! I’m so happy you liked the cookies. Thanks for the tip and for your comment! hi! why does the coconut oil need to be melted? and would you measure it cold and then melt it? Hi there! You can measure before or after melting because 1 tablespoon of firm or melted still equals 14 grams. If your coconut oil is soft enough to be combined easily into the batter, it doesn’t have to be melted. Soooooo goooood! Made them just as instructed. My husband loved them and is requesting I make them again. So…winner! Woohoo! Always a good thing when the husband requests them again. :) Thanks for your comment! Love LOVE this recipe but it is difficult to keep it consistent for me. Any chance you have flour measurements by weight?! So happy you like it! :) But I’m confused. Grams are already listed. Were you maybe looking at a different recipe? Hey there! I’m making these as thank you favors for a friends baby shower. I did a test run and they were DELICIOUS and got good reviews from my friends. I added in almost a Tbsp of cardamom and some enjoy life chocolate chips. I was wondering how you would go about making them before an event? Would you freeze them, refrigerate them, or anything like that? They’ll be packaged in plastic wrap inside of a cute little glassine bag. Thanks for your input! Hi! Oooh. Cardamom sounds like a delicious addition! These cookies stay good for quite a while at room temperature. How many days before the event do you want to make them? I looove the cardamom addition! It’s such a wonderful lemon companion. I wish there were allergy free white chocolate chips!!! I was considering starting them today, so a week in advance. Let me know what you think! Sorry for the slow reply! I think I’d refrigerate them just to be safe. I haven’t tried freezing them so I’m not sure about that. Sorry I don’t have a better answer for you! Hi Erin! So does this recipe only make 9 reasonably sized cookies? I’m having a get together of about 15 people so I want to make sure I have enough. I’m assuming I should probably double the recipe. I’m making another cookie too so I assume doubling will be enough. Hi Hima! Sorry for the slow reply. And you’re correct. I would definitely recommend doubling the recipe. :) I hope you and your guests will enjoy them! Another delicious recipe. So easy, too! Definitely a keeper! hi! can i sub all purpose gluten free flour for the almond flour? I don’t but you could use this recipe analyzer if you’d like for that info. :) I do know that these aren’t low-fat, though. AWESOME recipe!! Made these today and followed the recipe exactly (except doubled) and they were 100% perfect! Sightly chewy on the outside and soft on the inside and fantastic flavor. Thank you for the recipe- this one is a keeper. You’re welcome! I’m happy that you think they’re a keeper and good to know that they double well. :) Thanks a bunch for your comment (and sorry for my slow reply!). I was looking for something gluten-free and lemony and eggless – as I don’t have any eggs – and I found and made your recipe. I used butter and honey as they befriend lemons so well. I used 1/4 cup of honey and added lemon juice to bring it up to 1/3 cup. The cookies are beautiful and delicious. Thanks for a great easy recipe! That’s great to know that butter and honey work well! I’m happy that you enjoyed them. :) Thanks a bunch for your comment! I love these cookies. My grandchildren made them for me while I was working. They used all purpose gluten free flour. They’re so easy to make and I love the taste. The grandchildren liked them too. So did the use the gluten free flour in place of the almond and coconut flours?? I unfortunately don’t know (and don’t think she’ll see your comment unless she visits this page again). Sorry about that! Can I use Tigernut flour instead of almond flour? I’ve never tried it so I have no idea. I’ve only made a few recipes with tigernut flour and don’t have much experience with it. Sorry about that! You didn’t follow the recipe, so maybe don’t share how you didn’t like it. Unfortunately flour can’t be subbed for almond/coconut flour. May want to look for a non vegan lemon sugar cookie recipe. Haha. I like how you see the green cookies as just more festive for the holidays. :D I’m happy to hear that they came out well with sunflower seed flour! That’s a great tip for the nut-free people. Thanks a bunch for your comment! Thanks for the nut free tip. I’m so happy that the cookies came out well with your changes! Added coconut sounds delicious. :) Nothing wrong with eating them all. It IS a small batch. :D Thanks for your comment! These are incredibly easy and SO delicious! This is one of my go-to recipes to make when I teach essential oil classes. I sub 8 drops of doTERRA lemon oil in place of the lemon extract. Always a hit! I’m somewhat late to the party but just wanted to as if you think they would work if I used Tigernut flour instead of almond and Cassava instead of coconut? I’m on the AIP diet and don’t tolerate coconut well :( These look so good that I’d love to try them! I’m also on AIP (despite the recipes you see posted on my blog) and am sorry to say that those flours aren’t at all interchangeable. :( You’re much better off finding recipes that are already AIP. I believe there’s a coconut-free AIP recipe roundup somewhere! I know because I started reacting to coconut for a while and basically everything AIP calls for coconut. Sorry about that! Wish I could help more. Thanks Erin – that saves me wasting expensive ingredients! I’ve never cooked with either before so will continue the search! You’re welcome and good luck (with baking and AIP, in general!). I made these cookies a few days ago and they were soooooo good. I’m dairy free but thought why not try them even though they are gluten free also. YUM! I followed your recipe exactly as is. The only problem I found, the batch didn’t make enough but an easy fix! LOL I will definitely make these again, probably in a few days but triple the batter so I’ll have cookies for a few more days!!! Haha. I’m sorry the yield was so small! I hope that your triple batch will come out well and that it’ll be enough to satisfy your cooking craving. :D Thanks a bunch for your comment! Oh man, these look incredible. I’m not a big lemon fan but I did love those lemon cooler cookies growing up. I’m wondering if anyone tried sprinkling powder sugar on top. Can’t wait to try the recipe. Can you use fresh lemon juice instead of lemon extract? I haven’t tried it but some of the commenters have with success. They just won’t be as lemony! Finally made theses cookies! So yummy and delicious and moist. Followed the recipe exactly, except I was confused by the unblanched flour so they don’t look like the photo. Just a little darker. I used butter instead of coconut oil and honey In place of the maple syrup. Super fab cookie. I was going to bring them to a party but I might be a little greedy with them now. Ha. Haha. Nothing wrong with keeping them for yourself! I also have that “bake for a party but don’t want to share” problem. :D I’m so happy you liked the cookies! Thanks for your comment. My sister has celiacs disease so I’m going to freeze them and share with her. I know she’ll appreciate them more than anyone else. I can’t wait to try some of your other recipes. Thanks for sharing! That’s so nice of you to make something your sister can eat, too! And I hope you’ll enjoy the cookies, too. :) Thanks for your comment and I hope you’ll like the other recipes! This is a great recipe I used sunflower seed flour because my husband is allergic to almonds and it tasted great, but I had to laugh at the beautiful green color on the inside! After baking the cookie and waiting for them to cool we broke the cookie in half and got the surprise of our baking lives :) They were a lovely/scary shade of green! I had heard there would be green specks inside due to the sunflower/soda reaction, but wasn’t expecting a completely green center. We are new the Paleo/gluten free cooking arena and I am hoping that finding an aluminum free baking soda will remedy the color issue. Thanks for the recipe. Aluminum free baking powder wont alter the chemical reaction turning baked goods green. I make my own baking powder (baking soda and cream of tarter) and it still looks like I am celebrating St Patrick’s Day. It tastes good and is a great substitute with allergies, however! I am so very sorry I missed your comment, Barbara! I somehow missed it until someone else replied to it (I think because we were moving to another city on this day!). I’m so happy to hear that you all enjoyed the cookies despite their funny color! By the way, all baking soda is aluminum-free. I know some brands market their baking soda as aluminum-free, which makes people think that other brands aren’t. It’s baking powder (which isn’t paleo due to it having cornstarch) which isn’t always aluminum-free. Thanks for your nice comment and sorry again for my super slow reply! And for the Stevia funs, it worked fine! I used liquid one! You’re welcome! I’m happy that you enjoyed them and that they worked out well with Stevia. Thanks for the tip and your comment! Would you happen to recall how much liquid Stevia you used?? Delicious! Thanks for this amazing recipe. I made it for myself since I was craving lemon cookies and had planned to eat it ALL….but our 13 year old son on an unrestricted diet tried one and just said, “WOW…wow…wow!” quickly followed by, “Where did you get this recipe?” and “You need to make more from her site, then!” One minor thing I did- I used 1/4 cup maple syrup instead of the 1/3 and it was plenty sweet for me and our son. I’ve tried your chickpea cookies,too- absolutely too delicious! I will be trying a bunch more now!!! Thank you, Erin! Haha. I love your son’s reaction! That’s great that he liked them, too. Sorry that you have to share now. ;) Good to know that less maple works! And I’m happy to hear that you liked the chickpea cookies. Thanks a bunch for your comment! I hope you’ll enjoy the other recipes just as much. My son LOVED these he is 5 and is fresh to SCD with a diagnosis of Chron’s disease. Trying to keep up with baking and recipes and so far these are the best we have made. Thank you! What can i replace to maple syrup?? You could try agave or honey. If you use honey, you may want to lower the temperature a bit as it makes things brown more quickly. It’s great to know that honey works well! I love lemon + honey together. :) And awesome that you’ll be making them again! I’m happy to hear that. Thanks a bunch for your comment! Hi! These look and sound delicious! I was wondering if you thought maple syrup could be substituted with honey? Hi! Thanks. :) I haven’t tried it but I’m pretty sure it’d work. They might brown a little quicker so keep an eye on them! They turned out GREAT! I’ll definitely be making them again, thank you! Awesome! I’m happy to hear that. Thanks for your feedback! Girl I just made these – wow! SO TASTY! And sooo easy. I melted all the liquid ingredients on the stove and it became a wonderful carmely lemony goodness, just wonderful. Thanks for the inspiration! :) So glad I discovered your blog! I’m happy you discovered it, too! And awesome that you enjoyed the cookies. :) I’ll have to try melting everything together next time! Thanks a ton for your comment! Just made these! They were perfect! This is definitely a keeper! Thank you! Awesome! So happy that they’re a keeper. :) Thanks for your comment! Have you ever tried baking this as a loaf cake? Do you think it would work? Erin thank you for sharing awesome recipes! I made them with oat flour, and instead of getting a dry dough (because of the oat flour absorbing properties), it was very wet, even after being half an hour in the fridge. The flavour was not bad but it resulted in one huge chewy cookie – I loved how soft they are-. However, I won’t give up and I’ll keep trying! Greetings from Chile! These cookies are spot on! I love all things lemon, and these cookies are sure to satisfy my lemon cravings. The edges were a little crispy, and the inside soft and chewy. Perfect! That’s awesome! I’m so happy that you enjoyed the cookies and that they satisfied your cravings. :) Thanks a bunch for your comment! I am making these this morning. I made the dough last night. My dough wasn’t runny but I used room temp coconut oil. I also substituted agave for the syrup. By my calculations, the entire batch of cookies is 1702 calories (I just added up the calories in each ingredient. Again this is with agave which is 60 calories per tablespoon.) I made 13 small ones so mine are around 131 per cookie. I am excited to try the cookies. Goodness knows I ate some of the batter already! The room temp coconut oil probably made a difference! I hope they came out correctly. :) When I use melted coconut oil in one of my cookie recipes that calls for firm coconut oil, they come out a mess. Hopefully it’s not the same when it’s the other way around! I hope you enjoyed the cookies. Thanks for your comment! I do not have almond flour, can I still make these cookies with coconut flour only? Hi! Coconut flour is unfortunately not interchangeable with any other flour as it absorbs so much more liquid. Sorry about that! You could try hazelnut or cashew meal in place of the almond flour. Hazelnut flour worked out great! Thank you for posting! I cannot wait to try your recipe. I have a friend who is GF/DF and she loves all things lemon. I’m making these cookies to take to her house for a small get-together she is hosting this weekend. I think they’re going to be perfect! I made these tonight. I wouldn’t normally be a person to go for a lemon cookie but a friend of mine’s birthday is tomorrow and I thought I would make them for him. The only thing different I did is that I don’t have any lemons or lemon juice. But I do have these packets of true lemon and one packet is equal to one wedge of lemon. I have used them before and they work well. The only ingredients in them are lemon oil, powdered lemon juice and citric acid. I don’t know how many packets I put in…probably 8 or 9 and they are really good cookies. I wonder though if you can turn these into a non-paleo version. I think my son would like them but he is allergic to almonds. By the way, I doubled the recipe…so I put those 8 or 9 packets of True Lemon in a doubled recipe…not in a single recipe. What is the nutrition info on this recipe? Also whould oat flower be a good sub for the almond flour? (Sister is highly allergic to nuts) Thanks! I don’t have that info but you can copy and paste the recipe here for the nutritional profile, if you’d like. :) And unfortunately, nuts flours aren’t interchangeable with non-nut flours. I’ve heard of people using sunflower seed flour as a sub but I’ve never tried it and have no idea if it’d work here. Sorry about that! I made these today, mine were not runny at all, had a great cookie consistency, I refrigerated them anyway. I love the texture, mine aren’t very lemony, so I will add more zest next time. I use sugar free syrup and it can not be tasted at all. I am making them right now and my dough is perfect for cookies as well – not runny at all! Thank you for your comment – I wanted to make sure I didn’t ruin it and so glad your comment was here! Mine’s always like batter! I guess it’s my almond flour. I’ve changed the instructions to say that it may or may not be runny. :) Thanks for your comment! Hi Erin, awesome recipe! Mine turned out great! Will they last longer than four days if put in the fridge? Hi Sisca! I’m so happy you liked them. :) And yes, they will! Maybe a week in an airtight container? Thanks for your comment! These sound divine! i love lemon anything and have a very large quantity of coconut flour to use up! It’s used far more in paleo baking than it is in vegan and after I switched to vegan I found that it’s rarely used. I will be making these soon. As for your aquafaba question, I recently made a vegan cornbread that called for aquafaba and as I made it into a “meringue” consistency it was FANTASTIC! In no way do you get a single hint of stinky chickpeas! Now if course I added organic cane sugar but I still half expected it to smell like beans. I was simply elated to see how beautifully it rose and has the exact same feel as traditional meringue. It was just glorious. The juice of one can made far far more than I was expecting so my advice would be to start slow and with one can. Good luck! Your cookies are divine! I’m in love with the coco ahaha you know, so these were a savior for me after hours on the net looking for something decent. Baked them yesterday, but without lemon at all, and I substituted coconut oil with coconut goodness. On top of all, I added coconut goodness peanut cream and raw chocolate nibs on top. It seems these are absolutely different from yours now… BUT ANYWAY the idea was born here. Haha. I’ve made a coconut version of these, too! They’re good. :) But peanut cream?! Yum! Never tried that. Thanks a bunch for your feedback! I made these yesterday. The texture wasn’t batter like, but seemed just perfect to me. Didn’t chill them the full 30 minutes as didn’t feel it needed it but the end result ….. absolutely perfect! I shall be making these again for sure and doubling the quantity! I guess the dough consistency has to do with the coconut oil temperature and the brand of flour. I’m happy it worked out well for you and that you’re going to make them again. :) Thanks for your feedback! Erin what is the best substitutes for coconut oil and flour if a person doesn’t care for coconut? I’m hoping you can help me, I quadruple checked my recipe, because I was expecting my batter to be wet, but was instead very crumbly and dry, like a powder. What went wrong? I’m sure all my ingredients and measurements were correct, and according to the comments it wasn’t something that happened to anyone else. I was really looking forward to these! Any advice? Hi there! I’m sorry you’re having difficulties! Like you said, none of the other commenters have had that issue (and I’ve made these tons of times) so either one of the ingredients or one of the measurements were off. Or perhaps you really, really packed the almond flour? But even then, I don’t think it’d come out crumbly and dry. There have been times when I follow one of my own recipes (which has nothing but great reviews) and they come out terribly. Then I realize I added too much or too little of something. It happens. :/ I’m sorry! I hope you’ll give them another try. :) Maybe you could use a scale next time, if you didn’t last time. Well I have not given up hope, lol. I’ll be trying it again cause I really want these cookies! Thank you! Aww, yay! So happy that you tried it again and actually came back to let the others know that it was user error. Thank you! And sorry I didn’t see your comments until now. Thanks again! I just had the exact same problem. I followed the recipe exactly. Double and tripled checking everything. I used ghee instead of coconut oil but that shouldn’t have caused an issue but it came out very dry and crumbly. I added small amounts of ghee essentially doubling the oil and now my cookie dough looks more like pie crust dough. I am chilling the dough and going to try making them tomorrow. See how they turn out. I am glad I am not the only one though. Hmm. I did a video of the orange version of these cookies (which is exactly the same as these but with orange flavoring) which you can find here. You can see that the dough definitely isn’t dry and crumbly. Like I said in my above comment, something must have gone wrong (especially when you consider that nobody on the first page of comments had any issues). Sorry I can’t be more of a help! I hate it when something doesn’t come out well. What brand of almond flour did you use? What about eggs in the recipe? These cookies are delicious! The recipe sounds pretty versatile too. I am thinking you could change the extract and bake it into a cookie pie crust for Thanksgiving! 😊 I am going to have to test that!